If none of these periods suit, give us some options for your preferred dates and we will confirm if space is available. Bear in mind that the Americans tend to book in the first part of the year to coincide with their winter, consequently, space could be limited. 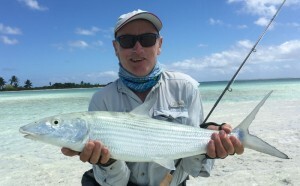 For Australian and New Zealand fishermen booking through Try on Fly only during the block booked period of July/August 2019 , the lodge trip cost is $3,150 AUD (excluding airfares). The trip price includes one guide per angler – only lodge to offer this service included in the trip cost. Registered Fishing Club group bookings and two week stays when booked through Try on Fly only, may qualify for a discount. Bookings through other Agents and Travel Agents could be dearer as they offer additional services. For all other bookings for the remainder of 2019 outside the block dates above, the trip cost is $3,250 AUD (excluding airfares). 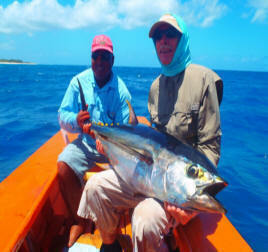 Six and a half days fishing (first day fish 10am to 4.30pm, other days 7am to 4.30pm). Fishing on departure day is not included but can be arranged at a small extra cost. 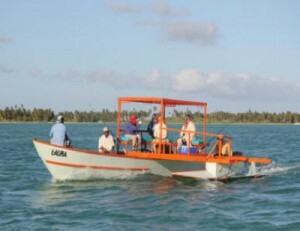 Groups of 8 to 16 fishers during the block booked period are hosted. Outrigger canoe or fiberglass boat transport to the flats or blue water fishing. Comprehensive briefing notes plus phone and email support to assist you to prepare. A get together for residents of SEQ and northern NSW to cover all aspects of the trip and some casting tips for the windy conditions. The option of truck transport to the Korean Wreck area for a spot of gear testing, weather and tides permitting. 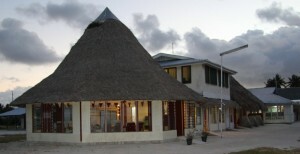 Air conditioned, twin share accommodation fronting onto the lagoon. Each room has its own ensuite with hot water, rooms are serviced daily with fresh towels and the whole lodge is spotlessly kept. Single room accommodation is available for an additional $350AU per week. The lodge has its own dive operation with qualified dive master, all equipment and a high end regularly serviced compressor for good quality air. Suitably qualified persons booked on a fishing trip can sample some of the world class dive sites the island has to offer. 4 bottles of water per day is included in the trip price. Filtered water suitable for drinking and teeth is available in rooms. Everyone who goes to Christmas Island talks about the experience for years. 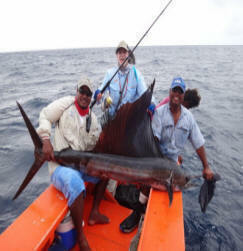 This has to be rated as one of the trips of a lifetime for any fisherman. 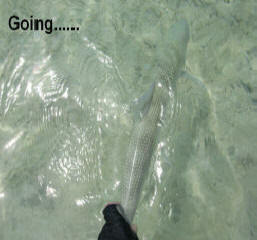 If you don’t feel that competent with a fly rod….bring along your spin rod, soft plastics and poppers. “THE VILLAGES” lodge was opened in June of 2006. It is owned and operated by the Kiritimati Protestant Church and all profits are used for the benefit of the community. The location overlooking the clear waters of the lagoon means that it is only a short 5 – 10 minute boat ride to several large shallow wading flats that are well populated with bonefish. 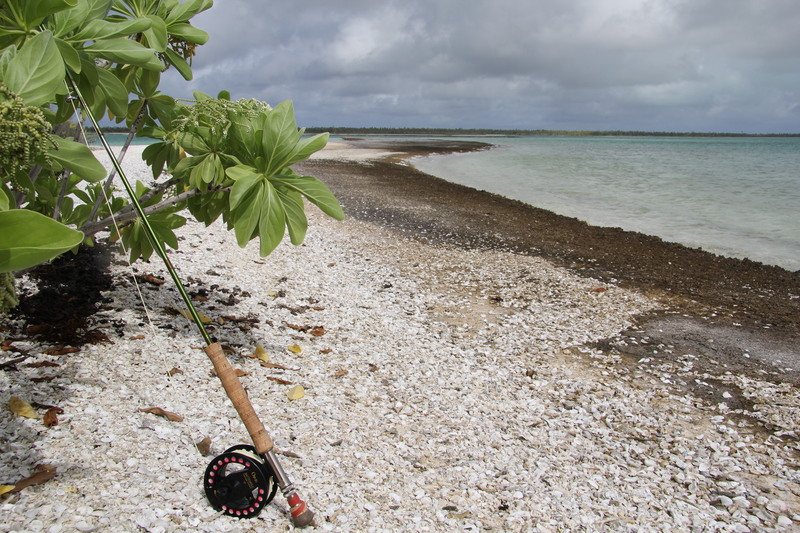 The proximity to the lagoon eliminates the necessity for time wasting truck trips thus maximising fishing time. There are 4 double bungalows comprising of two twin share rooms and an additional 3 single rooms that comfortably accommodate up to 16 anglers at a time. Although all rooms are fitted with air-conditioners, they are rarely needed as the rooms have been climatically positioned to take advantage of the ever present breezes. 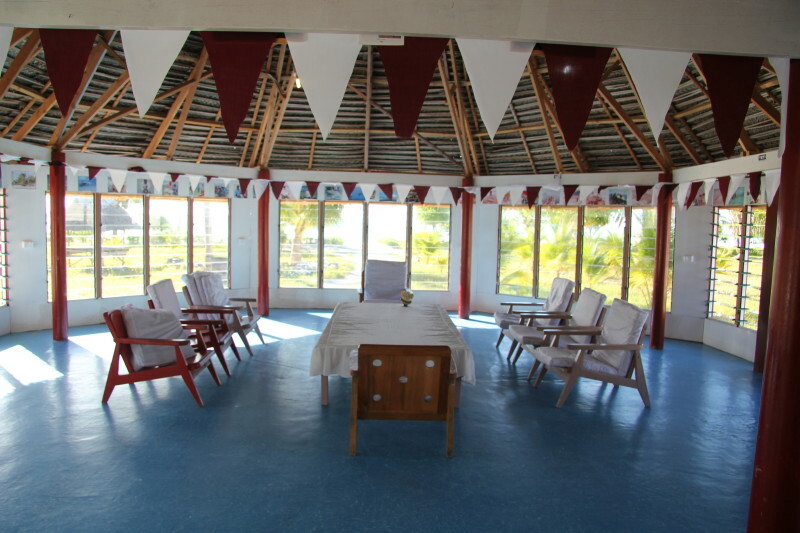 Each room has a private bathroom with hot water and a porch facing the lagoon. It is spotlessly maintained and fresh towels are provided daily when the room staff carry out the daily make-up. A “maneaba”, a local name for a meeting house, lies in the heart of the complex. A great place to relax after a days fishing, enjoy a cool drink and share the stories on the days conquests. A cooked breakfast of eggs, bacon, toast and pancakes is provided daily. Lunches are prepared by the individual according to their taste from a selection of bread, meats, cheese and vegetables. When available, apples or oranges are provided. Prior to the evening meal, fresh tuna sashimi can be enjoyed in the maneaba The evening meal of either locally caught fish, imported red meat and chicken with side dishes of vegetable and rice are prepared by an experienced local chef and served by his trained staff in the separate dining room. The entire “Villages” staff are friendly and always available to make your stay comfortable and most enjoyable. 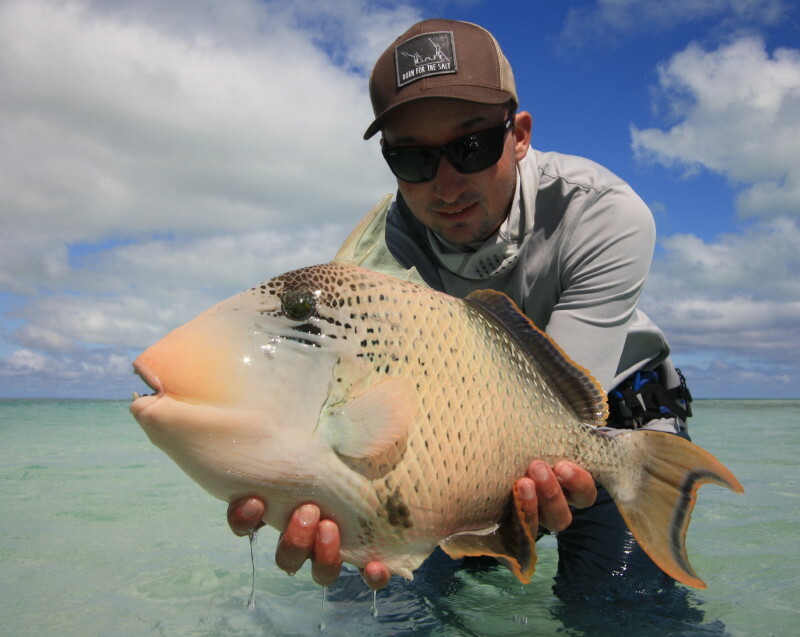 Anglers from the northern hemisphere choose the months of November through April to get away of the cold weather where they live while the southern hemisphere visiting anglers seem to choose July through to November. The reality is that, irrelevant of the time of the year, fishing is good for the whole 12 months of the year. Bonefish are caught on all phases of the moon. The quarter moons result in neap tides that result in smaller differences between high and low tide. 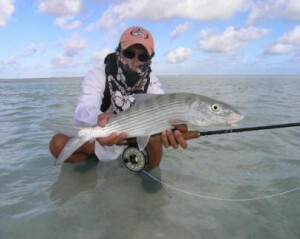 These tides provide a rising tide in the morning which is an ideal tide for the bonefish to move on to the flats to feed. 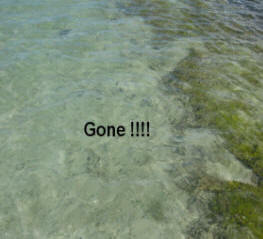 There is also less water movement so the sand is not stirred up as much resulting in clearer water. Perfect conditions for sight casting in skinny water. 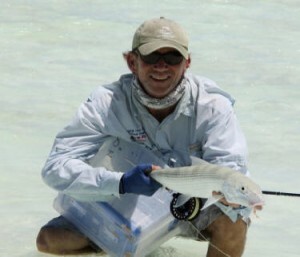 Many anglers prefer the full or new moon periods as the spring or higher tides provide more opportunities for the larger predators such as trevally. There is a falling tide in the morning and a rising tide in the afternoon. Bonefish can still be caught on these tides but, when selecting a location, the additional water movement needs to be considered. 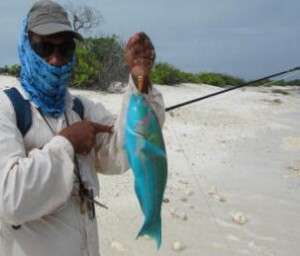 Instead of targeting fish moving onto the flats, the focus is to intercept them as they move off the flats. Three days after the full moon, many visitors target the congregating schools of spawning fish that appear adjacent to Paris Flat. Some large fish can be caught this way however it is difficult fishing for many anglers as they are fishing in waist deep water, and casting into the wind at dark smudges on the bottom in even deeper water. 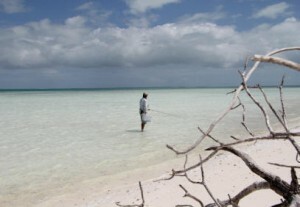 The lagoon is a maze of deep blue channels and white sand flats well populated with bonefish, some in double figure weight, as well as other species. 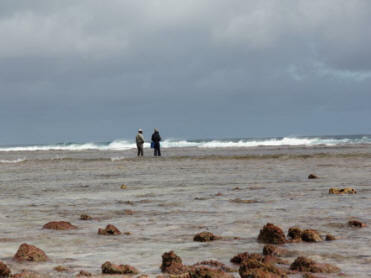 There are also miles of narrow flats and shallow reef zones on the ocean sides of the island that can be waded and fished when the tides are favourable. The guides are experienced and knowledgeable in all types of fishing and have an intimate knowledge of tides, the flats areas and the outside reef waters. Anglers are transported to the fishing grounds in versatile South Pacific style, sea-worthy outrigger canoes. 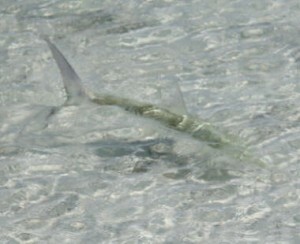 Bonefish are the primary species targeted on the flats. 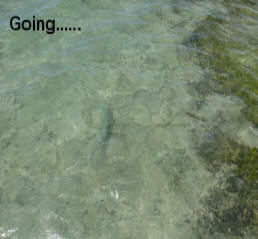 The challenge is spotting fish that have evolved to blend into their environment and to forage in ankle deep water. 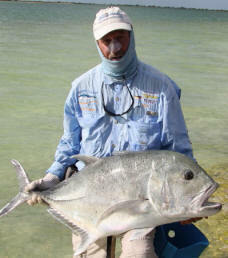 Other species such as trigger fish, goat fish, bluefin trevally, golden trevally, ladyfish and monster giant trevally frequent the flat edges. The open ocean reef drop-offs provide some exciting light tackle fishing for tuna species, GT’s, wahoo, rainbow runners, sailfish and numerous reef species. 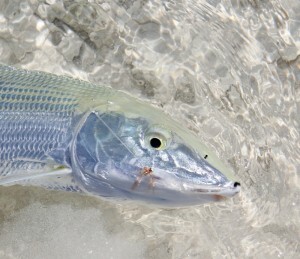 For bonefish, sparsely tied Crazy Charlies and Gotchas seem to be most effective. 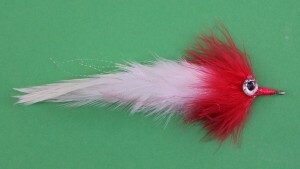 The most popular designs use #6 and #8 hooks, orange and pink thread, krystalflash tail and body with a tan wing and a couple of strands of krystalflash as overwing. 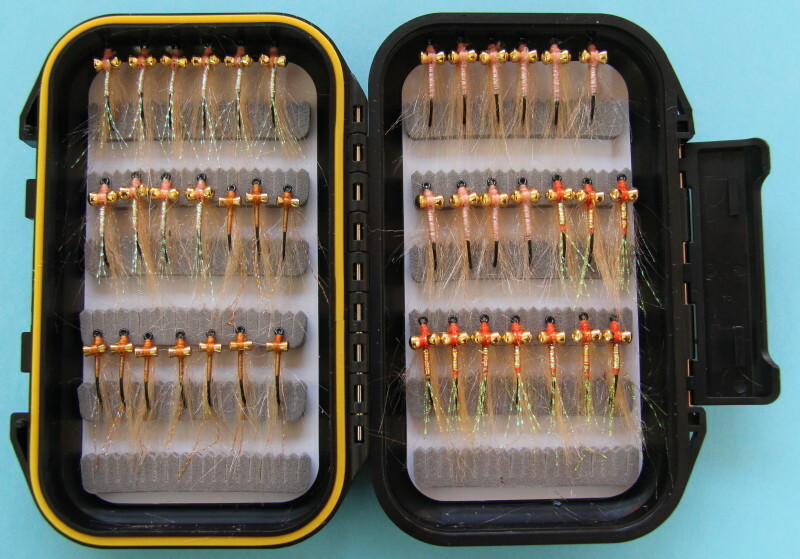 Produce the flies with a variety of eye sizes from beadchain through to hourglass to suit varying water depths and currents. These same designs are also used for trigger fish and the other species that frequent the flats. 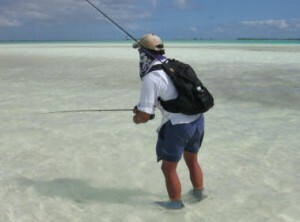 Small crab and shrimp patterns tied on strong hooks have also proved effective for trigger fish. 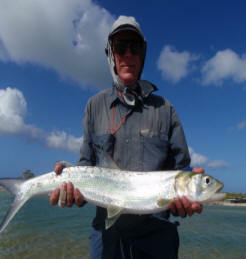 For smaller trevally, a white clouser minnow tied on a 1/0 hook is a good choice. 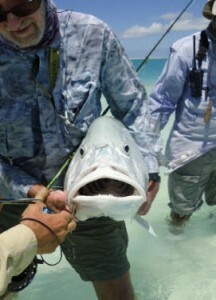 The larger trevally require a larger fly and a strong hook preferably in the 6/0 size range. Any bait fish style fly such as deceivers, bush pigs, flash tail whistlers and flashy profiles will be effective. 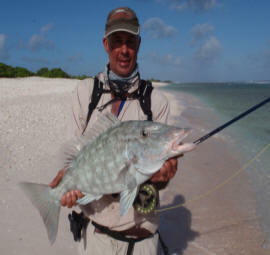 The “chook on a hook” style below has accounted for a number of large trevally. 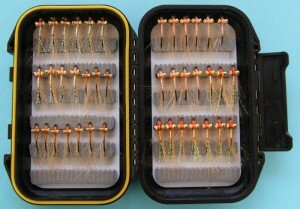 These same style flies can also be used for the blue water species. The assassin style fly is good for use around reefy areas as the hook point up design helps to prevent it fouling on the rough bottoms. Christmas Island‘s official name is Kiritimati (ti is pronounced as an s) and it is part of the Republic of Kiribati, pronounced “Kiribas”. 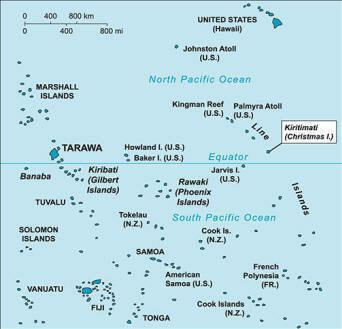 The capital of the Republic is Tarawa and is about 1700 miles to the west. The Australian dollar is the official currency, but US dollars are also accepted. 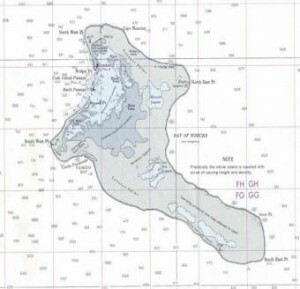 Christmas Island comprises over 70% of the total land area of Kiribati, a country encompassing 33 Pacific atolls and islands Christmas Island is the largest atoll in the world, encompassing about 250 square miles including the central lagoon and salt water ponds, that occupy about 125 square miles. 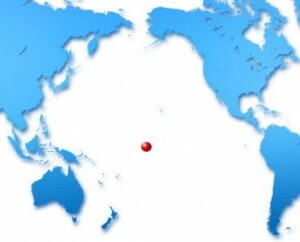 It lies 232 km (144 mi) north of the equator, 6,700 km (4,200 mi) from Sydney, and 5,360 km (3,330 mi) from San Francisco. 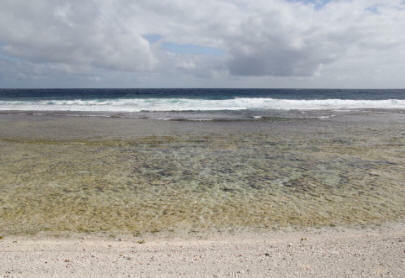 Christmas Island is the first inhabited place on Earth to experience the New Year. Despite being 2,460 km (1,530 mi) east of the 180 meridian, a 1995 realignment of the International Dateline by the Republic of Kiribati “moved” Christmas Island to west of the dateline. The temperature is constantly between 24°C and 30°C (75°F and 86°F) with little seasonal variation. Easterly trade winds predominate. 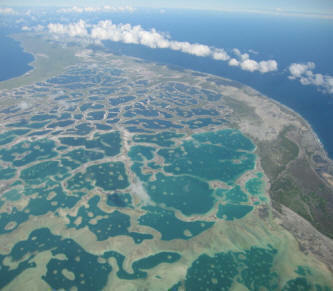 The early morning flight in gives a great view of the fringe reef system and the expanse of the lagoon and sandflats. The name “Kiritimati” is a rather straightforward respelling of the English word “Christmas” in Gilbertise in which the combination “ti” is pronounced “s”, and the name is thus pronounced “ke ris mas”. Christmas Island was discovered by Captain James Cook on Christmas Eve 24 December 1777, hence the name. It was claimed by the United States under the Guano Lands Act of 1856, though little actual mining of guano took place. Permanent settlement started by 1882, mainly by workers in coconut plantations and fishermen but, due to an extreme drought which killed off tens of thousands of Coconut Palms, about 75% of Christmas Island’s population of this plant, the island was once again abandoned between 1905 and 1912. European settlement in the island goes back to Father Emmanuel Rougier, a French Priest who leased the island from 1917 to 1939 and planted some 800,000 coconut trees there. He lived in his house in the Paris Flat area (now only small ruins). He established a port facility in the vicinity of the area now called London. Joe’s Hill was named by Joe English, who served as plantation manager for Rougier from 1915-19. English was left alone on the island for a year and a half (1917–19), with two teens, when cholera broke out in Papeete and transport stopped due to the First World War. English was later rescued by Lord John Jellicoe, an Admiral of the British Navy Fleet. English, still thinking the war was in effect and that the ship was German, pulled his revolver on the British Admiral, causing a short standoff until some explanation defused the situation. Christmas Island was occupied by the Allies in World War II. The Americans took over the island garrison and allowed Australian troops to be redeployed for mainland defence. The Island was important to hold because if the Japanese had captured it, an airbase could have been constructed that would have allowed interdiction of the main Hawaii-to-Australia supply route. For the first few months there were next to no recreation facilities on the island, and the men amused themselves by shooting at sharks that swam into the lagoon. 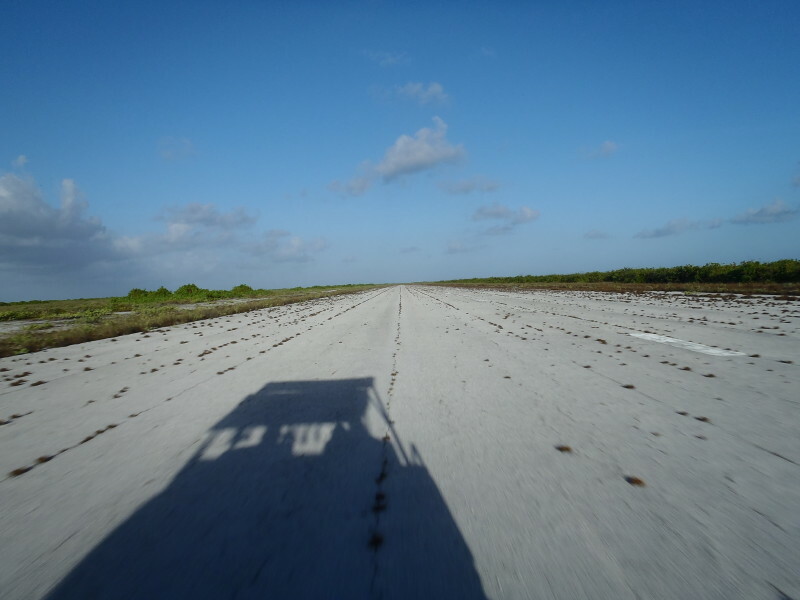 The first airstrip was constructed then to service the US Army Air Force weather station and communications centre. The airstrip also provided rest and refuelling facilities for planes traveling between Hawaii and the South Pacific. There was also a small civilian radio-meteorological research station. During the Cold War period, there was some nuclear testing in the Christmas Island area. 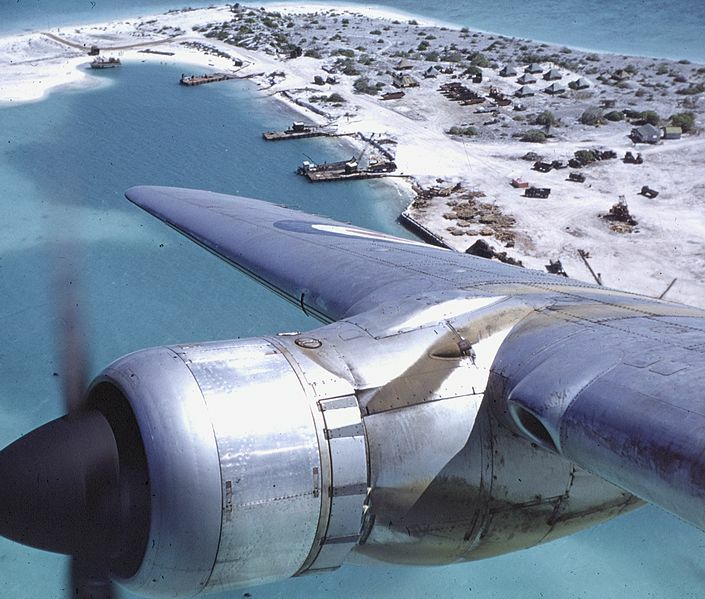 The United Kingdom supposedly conducted its first successful hydrogen test at Malden Island on 15 May 1957 with Christmas Island as the operation’s main base. The first H bomb was detonated by the British over the south eastern tip of Christmas Island on 8 November 1957. Subsequent test series in 1958 took place above or near Christmas Island itself. The United States conducted 22 successful nuclear detonations as part of Operation Dominic there in 1962. Some names like Banana and Main Camp come from the nuclear testing period, during which over 4,000 servicemen were involved from time to time. During these tests islanders were not evacuated. 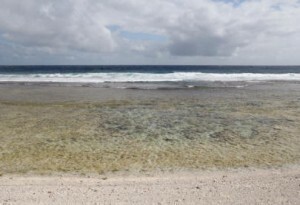 Subsequently British, New Zealand, and Fijian servicemen as well as local islanders have claimed to have suffered from exposure to the radiation from these blasts. By 1969, military interest in Christmas Island had ceased and the facilities were abandoned and for the most part dismantled. Some communications, transport and logistics facilities, however, were converted for civilian use and it is due to these installations that Christmas Island came to serve as the administrative centre for the Line Islands. In 1975 the Captain Cook Hotel was built on the former British military base. The island’s population has strongly increased in recent years, from about 2,000 in 1989 to about 5,000 in the early 2000s. The current population is around 7000. London is the main village and port facility. Government and ministry offices are located in this area. Cassidy International Airport is located just north of Banana and North East Point. It has a paved runway with a length of 6,900 feet (2,103 m). Fiji Airways have a weekly Boeing 737 schedule to the Island from both Honolulu and Fiji. A monthly air freight service is flown using a chartered Boeing 727 from Honolulu operated by Asia Pacific Airlines. Other supplies are carried by ship transport. The abandoned Aeon Airfield, constructed before the British nuclear tests, is located on the south eastern peninsula, NW of South East Point. In the early 1950s, Wernher von Braun proposed using this island as a launch site for manned spacecraft. The abandoned field had at one time had been proposed for reuse by the Japanese for their now-canceled Hope-X space shuttle project. There is a Japanese JAXA satellite tracking station on the island. Most of the atoll’s food supplies have to be imported. Potable water can be in short supply, especially around November in “La Nina” years. A large and modern jetty for handling cargo was built by the Japanese at London. Marine fish provide a healthy portion of the island’s nutrition, although overfishing by large foreign commercial operations has caused a drastic decrease in the populations of large, predatory fish over the last several years. Exports of the atoll are mainly copra (dried coconut pulp); the state-owned coconut plantation covers about 51 square kilometres (20 sq mi). In addition, goods like aquarium fish and seaweed are exported. A 1970s project to commercially breed brine shrimp in the salt ponds was abandoned in 1978. In recent years there have been attempts to explore the viability of live crayfish and chilled fish exports and salt production. Tourism primarily associated with anglers interested in both lagoon fishing for bonefish or offshore fishing provides a substantial amount of income. Week-long ecotourism packages during which some of the normally closed areas can be visited are also available to view the millions of migratory seabirds. In recent years, surfers have discovered that there are good waves during the Northern Hemisphere’s winter season.